Home » News » CHAOSFEST 2014: 3 Days Of The Finest Underground Metal At Scruffy Murphys, Birmingham Kicks Off Tonight! 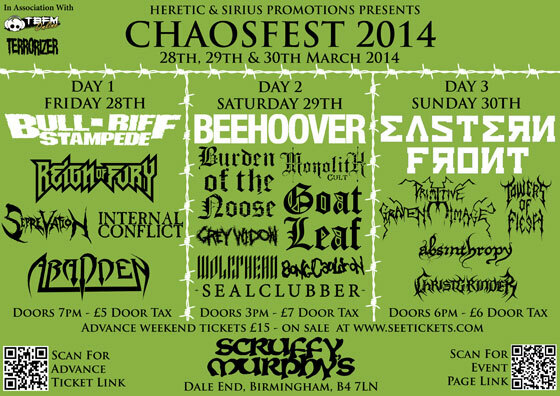 CHAOSFEST 2014: 3 Days Of The Finest Underground Metal At Scruffy Murphys, Birmingham Kicks Off Tonight! Heretic and Sirius Promotions have always been passionate about organising and running great DIY events. Although Scruffy Murphy‘s is only a small venue in Birmingham, it has always prided itself on being Birmingham’s Best Rock and Metal Bar/Venue, so where better to hold a 3 day festival style event celebrating the birthplace of Heavy Metal?! ChaosFest had its debut in 2012 with headliners – A Forest Of Stars, Witchsorrow and Hostile, respectively on each day, with 16 other bands performing over the weekend. This event was so successful that it prompted the organisation of the following year’s event. In 2013 they lessened the amount, but increased the calibre of the bands featuring headliners Sworn Amongst, Serpent Venom and The Atrocity Exhibit with 15 other bands. Testament to this is that fans from other UK cities such as London and even from France came for the weekend, hence their desire to make the following year even better. Now in 2014 ChaosFest has gone from strength to strength by being able to book international touring bands such as Beehoover, who will headline the ‘Doom’ night on Saturday. While on Friday, they have ‘Thrashers’ Bull-Riff Stampede headlining the ‘Thrash’ night, then ‘War-Torn Black Metal Titans’ Eastern Front will headline the Sunday’s ‘Black Metal’ night, with each day also having a full complement of 15 other bands storming the Scruffy’s stage! Weekend tickets are still available now for £15 from Heretic‘s webstore HERE, but if you just want to attend one of the days, you’ll be able to pay on the door on the day. There’s also a Facebook event set up for the weekend which you can check out HERE.